How many times we hear or read around us: ‘do not touch’. We would never say do not look or do not hear: so why do we think we can divorce ourselves from this one essential sense? Touch is a direct tool for knowledge. And tactile sensations cannot be expressed by words: we can understand them just by feeling and experiencing them on our skin. Contatto provides a new approach to the materiality of food, proposing new ways for food preparation and consumption. Aiming to get to the essence of the human-food relationship in its most genuine level, Contatto removes unnecessary mediating components’: the objects that create a distance between the body and food such as cutlery, plates and some preparation tools. Instead, preparation and consumption focus on the hand, extending taste to the realm of touch. Using the hand as a surface where food is placed, the ‘touches’ (the way the courses are called in the Contatto culture) are built on this surface of our body, generating new gestures, etiquettes and a new vocabulary, challenging existing ones. The action of serving becomes an intimate gesture between the ‘toucher’ (who is serving) and the ‘taster’ (who is eating), an asking-giving ritual. 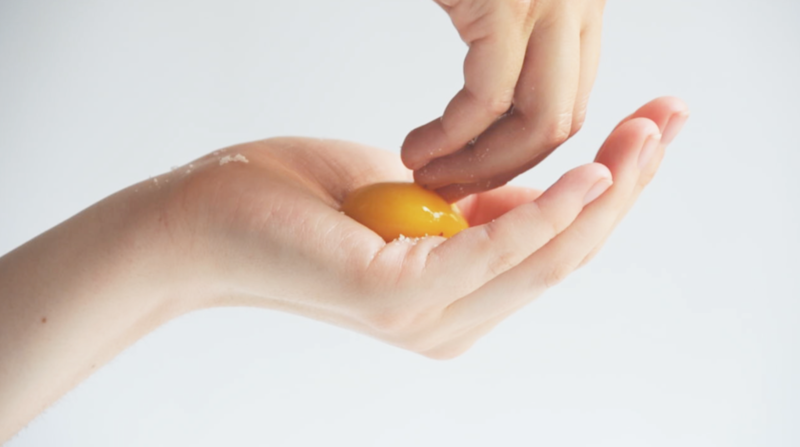 The toucher positions the ingredients directly on the taster’s skin, in a choreographed series of gestures, moving from the hand of one taster to the others. Even if not touching each other, the tasters are getting closer to each other: the toucher is guiding them in the same movement, they are part of the same choreography. Touching them one after the other is also creating a bond between them, feeling the same tactile sensations and emotions on the skin. The taster becomes an active participant of the process of preparing, serving and eating, reducing the distance that is a characteristic in a traditional western restaurant. It is not just an eating experience, it involves an intimate rediscovery of senses and tactility, becoming a sensorial celebration of food and the action of eating. And those intense emotions will permeate and stay longer on skin than the ingredients do. I truly hope in a future you will be touched by Contatto.